This weekend I wanted to go for something healthy, so I decided to make a soup. Here is the recipe for the Slovak sour bean soup, kyslá fazuľová polievka. This is one of my favorite soups, along with kapustnica and the lettuce soup. 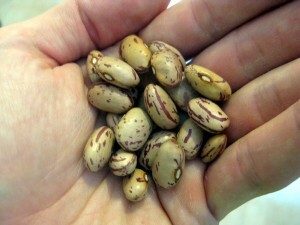 The beans (fazuľa) that grow in Slovakia are, well, bean-shaped, have spots and come in many different colors. I couldn’t find anything like that in my grocery store, so I ended up using “cranberry beans”. These were very much like the Slovak beans, except that they were all uniformly colored. 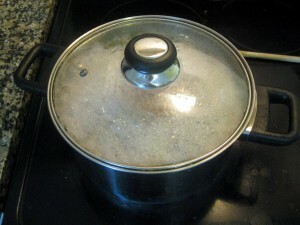 To make the soup cook faster, you start by soaking the beans overnight. 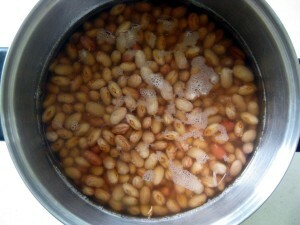 Rinse the beans, place them in a large pot and add 1.5L of water. Let sit overnight. Some people like to use fresh water, but the traditional way is to use the same water in which the beans had been soaking. Either way, the soup will turn out good. 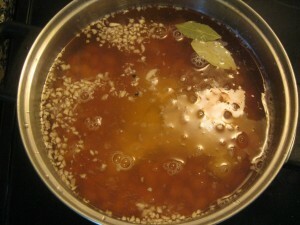 Add 2 cloves of crushed up garlic (cesnak), 2 bay leaves (bobkový list), and 3 black peppercorns (čierne korenie). I also added one potato (zemiak), cut into half-inch cubes. This is optional, but I like this soup better with the potato. The soup will foam up so stick around to reduce the heat. This foaming is due to the protein in the beans changing shape (denaturing). It’s similar to what happens when you add hops when brewing beer (I’ve made couple batches of beer in the past). Let the soup cook until the beans and potatoes get soft. This will take about 40 minutes. 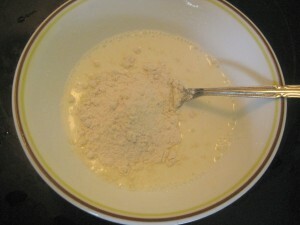 Then, make a mixture of sour cream, milk and flour. You want to use about 2 or 3 tablespoons of sour cream, maybe little bit more of flour, and enough milk to make the mixture liquid. Slowly pour it in while stirring. Take 3 slices of smoked bacon, and cut it into small pieces. Fry the bacon for about 3 minutes. You want it to turn pink, but not crispy brown. Add into the soup, and cook for another 10 minutes, until the sour cream mixture completely dissolves. And there you have it, Slovak sour bean soup! Enjoy! Since I’m one of Lubos’ roommates, I had the opportunity to be one of the first ones to enjoy this soup. As has been the norm lately, Lubos created another great dish. The beans were firm and scrumptious. The soup tasted delicious and I really enjoyed the slight hint of bacon. The potatoes provided some nice substance to the soup and also provided a complementary taste to the bacon. I’m definitely looking forward to the next dish that Lubos will make. Thanks Omar, that was a really nice comment! Hi Lubos, that sounds delicious, I am going to link to you for tomorrow’s post! What a great website! Your recipes are practical, useful and very well illustrated. You should compile a Slovak (and Czech) cookbook, using those techniques. Way to go! Thanks Joe! But I think I got ways to go until I am ready to make a book. It would be very short at present. OK, I was lazy, and so I did not use dry beans, I used a canned beans (Roman beans that are similar to Slovak beans) It cut the time in cooking, as you don’t need to “cook” beans, they are ready to go with just short cooking time to incorporate all flavors. oh yeah, I did another sin, I used sausages instead of bacon. Rest was the same as in Lubos recipee. Miro, I guess this is your confession, so you’re forgiven, but sin no more. (Or was this april’s fool joke?). I made the bean soup yesterday(I had the leftovers today. My gosh, we can turn the heat off) Cooked the beans slowly with ham bone for flavor and adding some good hungarian sausage from bende. ( Do any of you guys buy sausages from them?) Added also carrots to my soup and didn’t use sour cream. I made also these delicious garlic triangles to go with it. Sounds great Lubos! My Grandma made a similar soup with navy beans which our whole family loves. I look forward to trying this recipe soon. Growing up in Duquesne, Pennsylvania, my Slovak grandmother (Ceta) made this delicious soup often but it was ALWAYS accompanied with something I can’t spell but was pronounced luk-shaw. Simply made of leftover mashed potatoes mixed with flour and rolled into approx. 8-10 inch circles. They were cooked on the bottom of a dry skillet until brown spots appeared and flipped then brushed with melted butter and served next to the sour bean soup. As a kid they were soooo delish dipped into the tangy soup. Anyone remember?? You remembered almost right, Cynthia. The word is lokše, pronounced lok-SHE. Here is a recipe for lokshe as prepared by my grandma. Názvy slovenských jedál uvedených v zátvorke po anglickom názve nie sú písané gramaticky správne. Slovencina, na rozdiel od iných jazykov (anglictina, nemcina atd.) pouzíva velké písmeno len na zaciatku a teda napr. : Kyslá Fazuľová Polievka gramaticky správne je: Kyslá fazuľová polievka. Bolo by vhodné opravit vsetky takto nesprávne uvedené slovenské názvy vo Vasej web stránke (tento príklad “Kyslá Fazuľová Polievka” som vybral náhodne). I greatly enjoy this site. Mt grandparents were from Slovakia and I love these recipes. This soup turned out great. I used some leftover frozen ham from Christmas instead of bacon. Does anyone have a recipe for Beans and Lechke? It’s a lima bean soup with onions and tiny square egg noodles. We would add vinegar as well. My grandmother and mother made this when I was younger. My grandmother came from Michalovce. Have been looking for the leche and seems hard to fine. We used dried kidney beans, they have a little more flavor, soaked over night,drain & rinse. Add: water salt pepper, can use crushed garlic, bay leaf, 1chopped onion. let simmer until beans are tender. Not sure how long.Keep checking for water level. Cop 1 or 2 onions, saute in 1/4 to 1/2 cup margerine & butter. Brown a little for flavor. bring beans to boil & add onion/butter mixture. simmer till flavor is though. may want to try the orzo or small shells if can’t find the lechke. If you know where to get the letchke, please let me know. “Lecky” are actually patches of cabbage. I give and cinnamon. Then prepare to sweet with powdered sugar. Lubos is also a recipe for cabbage patches- lečky. This is also the bacon. lecky are actually noodles and you can use them with different food/recipes. You may make them at home, but I would not bother, you can find and buy a smimilar shape pasta in most stores. It’s called Maltaglianti pasta, fancy name but it’s a leftover from making more fancy pasta. Do you have a lentil Slovak soup recipe that you can post? Btw, I love your site and have been making many of the dishes. Thank you for sharing the tradional foods of Slovakia. This is sour lentil soup. Finally, add a little vinegar. Lentils can be cooked with potatoes and root vegetables, salt, pepper. Thicken with roux and season with grated garlic or green parsley. You can add chopped sausage. I’m trying to find a receipe for what my Mother called “pasula y letchke” soup. It was made with red Pinto beans and little square (1/2 inch)pasta. I can’t remeber what she made it with, but Ham keeps running through my mind. Anybody connect with that ? Yes “fazuľová polievka s lečkami”. This recipe is exceptionally good. I did omit the potato because I was too lazy to go out and dig one up. Still, the texture came out smooth and just thick enough.